Bloating? Abdominal Pain? Gas? These are issues we all have faced at one point or another and they all stem from the same place – the gut. The gut is so important to our bodies, it is responsible for absorbing nutrients from the foods we eat, producing energy to get us through our daily tasks, and so much more. 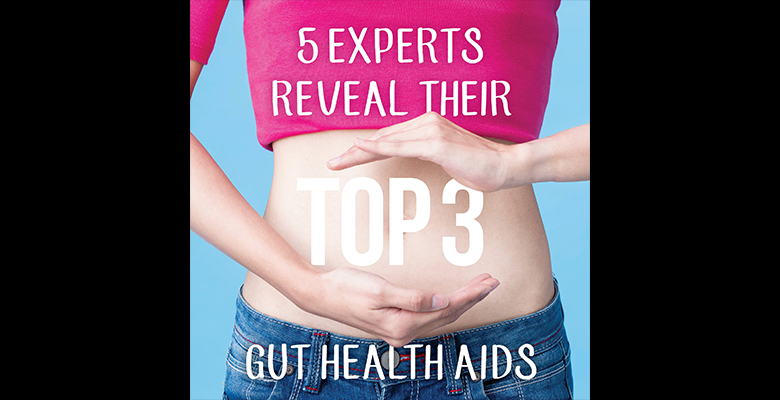 With the gut being responsible for so much, it is important to pay attention to your gut health, although sometimes you may need assistance from other resources. Our Healthy Living Advisors are sharing their favourite gut health supplements and sharing the benefits that you will experience. Meet our first Healthy Living Advisor, Emily. Emily is a current Healthy Living Advisor at Goodness Me! And a Registered Holistic Nutritionist. Emily has been involved in health and nutrition both recreationally and professionally since she was a teenager. Her experience includes personal training, managing a commercial fitness club, and now she is following her passion and working as a Registered Holistic Nutritionist. What is L-Glutamine? It is an important amino acid involved in protein synthesis. It can boost immunity and help to repair, strengthen and support the mucosal lining of the esophagus and gastrointestinal tract. It can reduce intestinal spasms and helps the body to produce glutathione which is our body’s most powerful antioxidant. Glutamine assists in maintaining the proper acid/alkaline balance in the body, and is the basis of the building blocks for the synthesis of RNA and DNA. It even makes a great supplement for athletes as it improves muscle recovery and can improve muscle hydration. Stress and injury cause the muscles to release glutamine into the bloodstream can which can cause depletion. Glutamine deficiency can also be caused by stress, medications and digestive disorders (heartburn, low digestive enzymes, undetected food allergies, etc.) which can damage the intestinal walls. The product is best for people who have leaky gut/intestinal permeability, ulcers, IBS, those dealing with high stress and recovering from injury/surgery. It has also successfully been used to prevent sugar cravings as it has the ability to stabilize blood sugars. L-Glutamine by Pure Encapsulations is easy to use, dissolves well in water and is tasteless, you can take 1-2x a day. Aloe Vera is a succulent plant member of the lily family. Ancient records show that the medicinal properties and healing advantages of Aloe Vera have been known for over 5000 years. It contains 18 amino acids, and vitamins A, B1, B2, B3, B6, C, and E. As well as potassium, sodium, calcium, phosphorus, magnesium, and chloride. Aloe Vera is filled with aloe polysaccharides. These are naturally occurring active components that hold a wide range of positive effects. The Aloe Vera inner fillet does not contain the aloe latex or outer leaf part of the plant and can be taken internally. It has the ability to improve digestive health, balance stomach acidity naturally, improve the immune system, promote tissue and cell regeneration, and also has anti-inflammatory abilities. Aloe can also be used topically and is effective for minor abrasions, acne, burns, cold sores, cuts, dry skin, insect bites, scrapes, eczema, skin moisturizer, and sunburn. One fact about aloe is it can promote a thin layer of nutritional coating in the lining of the stomach, esophagus, and gastrointestinal tract that remain intact for forty-eight hours – aiding in relief and stopping heartburn and acid reflux. This also means it provides relief to symptoms almost immediately. It has a very mild taste and can be taken just on a spoon or mixed into water. The Lily of the Desert is great because it is organic and there is no water or preservatives added and sold in a glass jar. Ensure it is stored in the fridge once opened. The Inner Fillet is recommended over the Whole Leaf, as the whole leaf can cause diarrhea for some individuals. It is generally safe with no contraindications other than avoiding if you have a latex allergy. Deglycyrrhized licorice is made from licorice root which has been used for thousands of years in Eastern medicine for its soothing and decongestant properties. The downside is that pure licorice root contains compounds that can raise blood pressure (when taken on consecutive days). So DGL is licorice root with those compounds removed. DGL is helpful for anyone who has IBS, heartburn, bloating, GERD, gas, acid reflux, constipation, and diarrhea. It has even been demonstrated to inhibit the growth of H. Pylori and reduce the risk of stomach ulcers. DGL can improve both the quality and quantity of the protective substances that line the intestinal tract and increase the lifespan of the intestinal cells while improving blood supply to the intestinal lining. It has also been used to ease sore throats and help in clearing bronchitis/respiratory infections. This product is great, as it is chewable and works quickly. The only downside for some may be that it does have a strong licorice taste. Caution needs to be taken if the individual has any kidney issues or is taking medication that lowers your potassium levels. Next up, we have Jaime. Jaime decided that he wanted to study Holistic Nutrition after he took the Lifewatchers program at Goodness Me! In 2011. Today, he is a Holistic Nutritionist, and has been working as a Healthy Living Advisor at Goodness Me! For 4 years. These products are truly food as medicine. And that’s why they are so well received. Fermented foods hold many pieces to the fascinating puzzle of gut health. When you have fermented food you are getting both the beneficial bacteria (probiotics), as well as the beneficial yeasts that your inner terrain depends on for proper balance and function. Fermented foods contain butyric acid which is lacking in those with mild to severe colon complaints, e.g., constipation, diarrhea, abdominal pain, urgency, gas, bloating, IBS, IBD, colitis, Chron’s disease, ulcerative colitis, etc.) The living culture in this line contains fermented l-glutamine in a whole food form which is effective for rebuilding or maintaining the integrity of the gut lining. This line is good to use as part of a healing protocol for, leaky gut, candida overgrowth, low immune function, auto-immune conditions, chronic or mild digestive complaints, skin issues such as eczema, psoriasis, acne, food sensitivities, seasonal allergies, cold and flu prevention, travel protection, weight loss, mood, sleep, detoxification, healthy cholesterol, and for general health. Triphala by Himalaya Herbal Healthcare is a favourite because it’s a gentle and effective colon cleanser that can be used daily, or as needed. Triphala not only aids the detoxification of the colon, it also tonifies the muscles of the bowels, making it great for anyone with chronic constipation, and for those who want to ‘stay regular’, without causing dependency. Minerals are vital in the proper functioning of the digestive system. Mineral Matrix is a whole food supplement making it easy to assimilate. 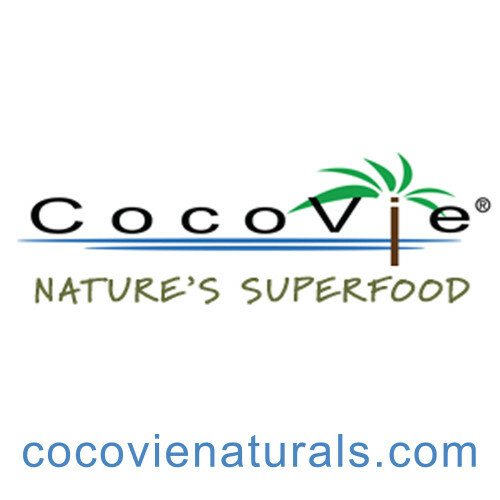 It has many benefits for our overall health including prevention and alleviation of osteoporosis, fatigue, food cravings, and as well as for our digestive health including alleviating stomach acidity, sensitive stomach, and constipation. Mineral Matrix is particularly good for those experiencing candida overgrowth as it is able to break down the biofilm created by the yeasts, making it easier to rid them from the colon. Our third Healthy Living Advisor is Jolene. Jolene has been a Healthy Living Advisor at Goodness Me! For 18 months and was hired straight after graduating from the Institute of Holistic Nutrition. Prebiotics are non-digestible carbohydrates that act as “food” for probiotics. Available in the foods we eat, such as beans, lentils, oats, and other vegetables, you can also supplement with prebiotics to help aid digestion. FibreSMART from Renew Life has 3 different prebiotic fibres. Flaxseed, Acacia Gum, and Guar Gum are all considered prebiotics. FibreSMART also has L-glutamine, marshmallow root, and slippery elm. L-glutamine is an amino acid which helps with gut healing. Marshmallow root and slippery elm are demulcents, meaning they increase the mucosal lining, which for those who have compromised digestion, can be of great benefit. It’s rounded out by Triphala, an Ayurvedic mix of herbs that is a great digestive aid. Combining all of these together leaves us with a great prebiotic powder or capsule that also has a strong focus on gut healing. Probiotics are the bacteria that live in our small intestine and colon. There’s a long list of benefits that they give us and the more research that is done, more benefits get added to that list. They produce 80-90% of the serotonin in our body, help build our immune system, and help us to digest and absorb nutrients from our food. A customer favourite is Living Alchemy’s Your Flora series. Considered more of a symbiotic, it doesn’t have the billions of bacteria you may be used to seeing, but it does have 35 different strains in each capsule. Using Kefir/Kombucha fermentation, the idea behind the product is to deliver a complete ecosystem to the gut. There is a whole food blend with each of the six options to choose from. Each blend targeted with herbs to help with specifics, like gas and bloating, slow transit, and general gut health. This is a shelf-stable probiotic and a bedside table essential, making it easy to remember. Digestive enzymes are supplements of enzymes that we use to break down proteins, fats, and carbohydrates which in turn, helps us to absorb more nutrients from our food. A go-to brand is Super Enzymes by Now. This digestive enzyme is a powerhouse blend, with Betaine HCI, ox bile, pancreatic enzymes, papain, bromelain, cellulase, and acid stable protease. This is quite the list, with each item focusing in on digestion in a different way. This is a very helpful enzyme, getting individuals through some difficult digestive times. Our fourth Healthy Living Advisor is Mercedes. 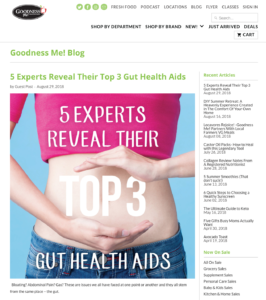 Mercedes is currently a Healthy Living Advisor at Goodness Me! 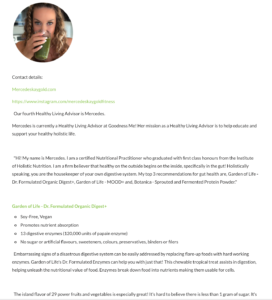 Her mission as a Healthy Living Advisor is to help educate and support your healthy holistic life. Embarrassing signs of a disastrous digestive system can be easily addressed by replacing flare-up foods with hard working enzymes. Garden of Life’s Dr. Formulated Enzymes can help you with just that! This chewable tropical treat assists in digestion, helping unleash the nutritional value of food. Enzymes break down food into nutrients making them usable for cells. The island flavor of 29 power fruits and vegetables is especially great! It’s hard to believe there is less than 1 gram of sugar. It’s amazing that ORGANIC DIGEST+ contains no artificial flavours, sweeteners, colors, preservatives, fillers or binders. Building a strong internal ecosystem is easy with Garden of Life’s MOOD+. The number one issue people seem to struggle with is stress. Work, kids, family, health and money issues can be overwhelming. Cortisol is a hormone secreted during times of stress, halting digestion. Cortisol makes blood sugar regulation problematic, lowers metabolism and often resulting in unwanted stubborn belly fat. The continuous release of cortisol targets adrenal glands and thyroid. Stress increases inflammation in the body and over time leaves us vulnerable to a surplus of scary health issues. Garden of Life’s powerful probiotic contains 16 different strains and 50 billion CFU per daily dose. MOOD+ contains ashwagandha, an adaptogen found in Ayurvedic Medicine. This famous herb helps to achieve emotional balance, relaxation, and overall well-being. MOOD+ helps manage stress and revitalize with the addition of immune enhancing organic Alaskan blueberries. Beautiful blueberries are also amazing anti-oxidants fighting free radicals throughout the body. By consistently choosing raw food sources, like Botanica’s sprouted and fermented protein powder, your digestion system will thank you daily. Enzymes in fermented foods are still intact, helping the body break down food into usable pieces. Fermented foods help good bacteria thrive, strengthening our brain-gut connection. Happy gut, happy life! Our final Healthy Living Advisor is Maggie. Maggie is a Healthy Living Advisor based out of the Upper Gage location in Hamilton, Ontario. Maggie regularly deals with stressed customers who share their health concerns and digestive needs. She has become confident in guiding them to great products that will give them ease and restore balance. “Hello! My name is Maggie. As a Holistic Nutritionist, I greatly value the opportunity to advise on remedies that can readily assist and provide information on rebalancing health issues; I firmly believe that supplements used in specific care of the digestive tract must be those that best address the concern and offer targeted results; they must be easy to take, offer good absorption while being as pure as possible, without additives, stabilizers and preservatives. Triphala’s popularity comes from its rebalancing properties that help almost everyone to find ease from discomfort and feeling slightly “off” or in need of a “tune-up”. It is a digestive tonic created from three fruits, originating out of India and 4000 years of Ayurvedic medicine practice. These healing fruits, when put together in a proper and precise ratio, create a digestive synergy which helps to restore balance to the body. As a supplement, Triphala, while providing bowel regularity and effective waste removal, offers a gentle colon cleanse, due to its detoxification properties. It also tones the liver, thus supporting the assimilation of nutrients in the body. Triphala addresses common concerns such as indigestion, bloating, constipation, diarrhea, and acid reflux. It provides balance and modulation to the digestive system, tuning up the body simultaneously for those who may be having issues with nutritive absorption, as well as with elimination. 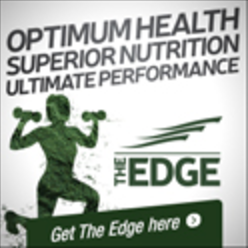 It is a vital part of supporting the core of digestive health and an incredible complement to most digestive aids. Fermented foods have been found to be extremely healing and beneficial to balancing digestion. Living Alchemy has managed to develop a product that is both based on fermented foods and is also healing. Probiotics help serve the digestive system by providing the gut with good bacteria that enhances digestion and absorption, protects the delicate digestive lining; supports the immune system and gives the body energy through the production of vitamins, such as the B and K vitamins. The bacterial culture in Terrain provides grounding and stability to establish the foundation for the gut to flourish with good bacteria, allowing for the production of vitamins, amino acids and other life-giving, energy providing nutrients. The shelf stable, easy to take, probiotic supplement offers the best opportunity for the user to thrive by offering pure, easily recognized nutrients encapsulated without heat. It offers 35 strains of bacterial flora and is suitable for all diets. In addition, organic herbals are added to support and soothe the needs of the vulnerable digestive lining, such as slippery elm, marshmallow root and repairing Aloe Vera. This is a product that complements the use of amino acids like L-glutamine as a result of its ability to soothe mucous membranes within the gastrointestinal tract (GI tract). It is beneficial for all who seek to set up a firm foundation in the gut and is especially soothing for persons with digestive issues and slight intestinal inflammation as well as those who are using probiotics for the first time. At some point or another, digestion goes off course and it is important to support the stomach. As humans age, the pancreas begins to reduce its ability to produce enzymes that support digestion. Without these enzymes, our bodies are unable to properly absorb nutrients. New Roots Digestive Enzymes with Betaine Hydrochloride (HCl) is an effective digestive aid because it provides an excellent base for digestion and absorption, by breaking down a broad spectrum of foods to smaller more digestible particles, with a not too overwhelming amount of betaine hydrochloride to support essential stomach acid production. The pancreatin (which contains amylase, lipase, and protease to digest all food groups) is from a porcine source (so not a supplement for vegans and vegetarians), however, people who eat animal protein diets, often have low digestive enzyme levels and this supplement is very helpful for them. In addition, Ox bile or bile salts as part of this formula helps with the often difficult to break down fats from animal protein in the body and also with the absorption of fat-soluble vitamins. New Roots Digestive Enzymes with HCl, also contains papain and pepsin which help to initiate protein digestion in the stomach. This supplement uses non-GMO sourced ingredients and is complementary and supportive to all who eat animal protein diets. It is useful for those who suspect they may have low enzyme levels and show signs of imbalances in digestive health such as bloating, gas and a sensation of constantly being full. READ my ARTICLE at Goodness Me!